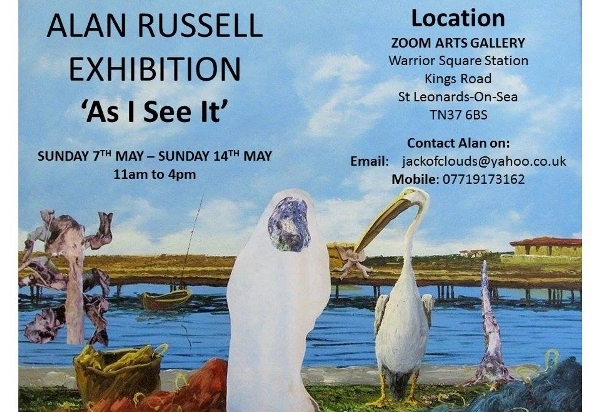 Zoom Arts continues its series of exhibitions at its Warrior Square station gallery with a show entitled As I See It by Alan Russell. The artist explains how he produces his work. We all see the world in our own way. These are some of my observations. My photos are mainly from observing the unusual in everyday life. They suggest something other than what they appear to be. Some stand alone, as they are. Others suggest an idea for a collage, or are taken for that purpose. My collages evolve from many sources. My original character developed from something I had at home, to become Miss Havisham from Charles Dickens. I have created several more ‘signature’ characters since. None are what they appear to be but are generally accepted as they are portrayed. Part of my theme is creating surreal characters in a whimsical way, whilst examining perceptions of relationships and how we categorise things to make sense of our world, male, female, human, alien. My own paintings are mostly abstract and, in some cases, acquired paintings I have reworked, or added collage to, using some of the original theme. I have gone from life drawing, etching and painting to mainly photography and collage, which I constantly have new ideas for. As I See It Exhibition by Alan Russell. Zoom Arts Gallery, Warrior Square Station, Kings Road, St Leonards-on-Sea TN37 6BS. Sunday 7-Sunday 14 May, 11am-4pm.